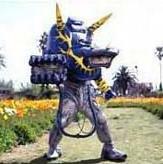 Force Rangers summon their Wildzords to assemble the Wild Force Kongazord. Retinax. Retinax grows to become giant sized to finally prove himself worthy. uses his staff to destroy Retinax. He walks away to seal his secret. Perhaps we will some day find out what it is. to the ground. Zenaku picks it up and claims his prize from the battle. he won't be so easy on them. reminds him of a previous claim he made to them to stay out of his forest. 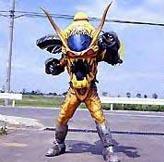 my Elephant into one of his dark Wildzords?" Alyssa wonders. discover an out of control bus, and they track it down on the Savage Cycles. 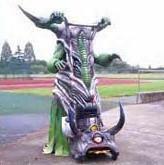 his Giraffe Zord is taken away by Zenaku. by Zenaku. It is Motorcycle Org, who Taylor remembers having to fight before. On her first mission as the Yellow Ranger, she went up against Scooter Org. Since she was unable to handle him, Shayla sealed him away with her magic. for him. "Where did you get that neckalace?" Zenaku demands to know. blood is red like that of human blood. block his thoughts. If things weren't bad enough, the Lawn Mower Org is born. 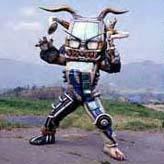 But to everyone's disbelief, the Lawn Mower Org is destroyed by Zenaku. bring Merrick back? 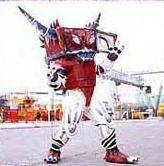 Note: Armadillo and Rhino Wildzords debut.